An eco-conscious product line that blossoms into flowers. Remarkably innovative Stationary and Note cards made from 100% recycled cotton and abaca fibers, which when planted blossom into perennial wildflowers that attract and nurture the endangered honey bee. 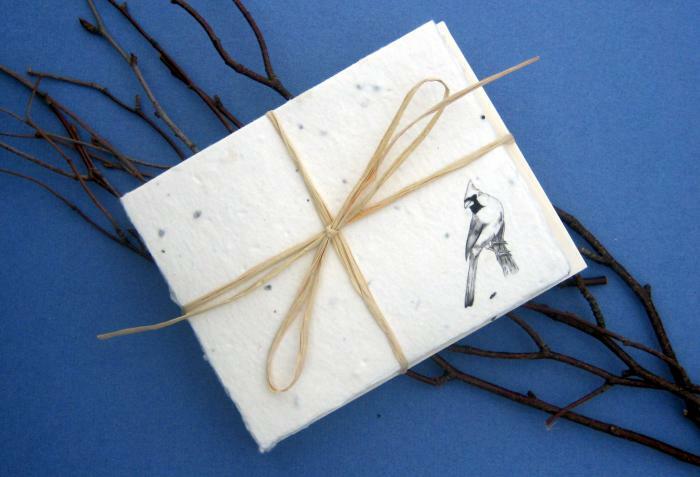 Each is printed with a realistic bird illustration. Our Meant-To-Bee Feathered Friends Notes and Stationary are available in White only. Includes 10 handmade notes, blank writing inserts, planting instructions and matching envelopes. Packs come in all one style of bird.